Oh no – watch out! 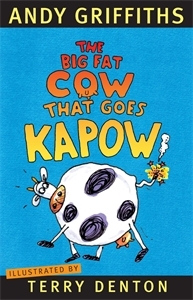 Inside this book is an EXPLODING cow! More rhyming mayhem and comic madness from the bestselling duo of the inspired JUST! series. Andy Griffiths rhyming text – that will entice and engage the most reluctant child to read while laughing all the way – is hilariously counterpointed by Terry Denton's delightfully wonky illustrations. A side-splitting companion to the award-winning and Children's Book Council shortlisted title, The Cat on the Mat is Flat.